A Caterham Seven is the car I always wanted to drive. When I finally had the chance, I hot-footed it to Wales to recreate all the magazine features I’d grown up reading, where heroic journalists leapt Caterhams through the air and wrestled with oppo on sunlit Welsh moors. In reality, it rained (it was October). The lights stopped working and I hated it. It was cramped, the steering was heavy and I struggled to drive it without mashing all three pedals at once. I wrote this piece about what I’d learned in a bid to come up with sensible, objective reasons why the Caterham and I didn’t bond. While the last Caterham I drove was a 310R, packing 154hp from its 1.6-litre Ford engine, this is the entry-level Caterham 160 in Sprint guise. The ‘160’ bit relates to the engine, a three-cylinder turbocharged unit producing just 80hp (or 160hp per tonne). The Sprint model, for an extra £8,000 over the standard 160, gets various retro touches: individual rear lights, cream wheels with chrome hubcaps and a wooden steering wheel to name a few. Dropping myself into the Sprint’s cabin, I remember everything I don’t like about Caterhams. At six-feet tall with size nine feet, I’m hardly a man mountain, but pushing the limits of the size of person who’d feel comfortable in a Seven. It’s not exactly the incredible driving experience I expected, either. Or at least, it wasn’t at first. This isn’t a car that pampers the driver. You can’t jump in it and feel like a driving god. With no power steering, it requires muscles around town, while out of town, the feedback is instant but also mildly unnerving. Should you reach the limits of grip, a flick of the wrists won’t bring the Seven back in line. You have to be prepared to wrestle with the steering wheel – and that’s only possible if you have hands the size of Donald Trump’s. The same could be said for the pedals. While cars like the Mazda MX-5 are designed to flatter the driver, the Caterham will make a song and a dance out of any poor pedal work. Like the steering, a meagre twist of your right foot won’t blip the throttle and reward your heel-and-toe action. Assertive inputs are needed if you’re going to drive a Caterham properly. And then there’s the feeling of vulnerability. You’re tiny. You’re close to the road, and you’re not even protected by metal doorskins should you get it wrong and come into close contact with a tree. I avoided Wales on this occasion, opting for the closer (yet still far enough) Peak District, and a diesel Audi A3 was very happy to remain glued to my rear bumper at times. This wasn’t the Caterham’s fault, and nor was it entirely because my own skills fell short – instead, my sense of mortality was multiple times greater than Mr A3 with his traction control, crumple zones and air bags. I don’t mind admitting I wasn’t brave enough to exploit the Caterham Seven to its maximum potential on public roads. But, when not being hassled by Audi drivers, the Caterham’s feeling of vulnerability adds to the fun factor. We like being scared – it’s the same reason some of us love rollercoasters and why people braver than me ride powerful motorbikes. Unlike more powerful models, the 160’s 80hp is true to the Lotus founder Colin Chapman’s “Simplify, then add lightness” philosophy. Its short gears means it still feels more than quick enough up to around 70mph. And you won’t particularly want to go any faster than that. One section of my route, over the Cat and Fiddle Pass, has a blanket 50mph speed limit enforced by average speed limits installed by the fun police. Rather than ruining an enjoyable drive, the low-powered Caterham revels in it. Maintaining progress through the bends and trying to average 50mph on the twisty moorland road is a challenge in itself. Faster cars would be in danger of troubling my clean licence while also not being as fun. You can read Tim’s wonderful, objective report on the Caterham Seven Sprint here, but I’ll end by saying I’ve never changed my opinion of a car over one weekend as much as I did with this. I don’t think I simply got used to the Caterham over my time with it – more, that I learnt to drive it properly. 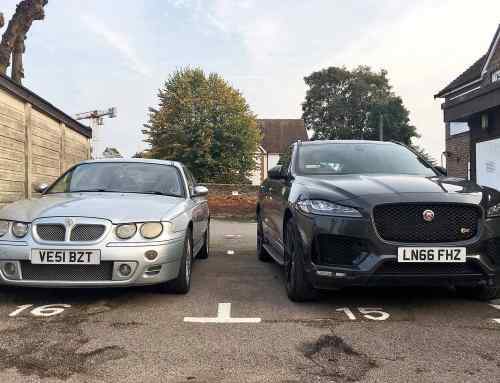 It was never a bad car, simply that, in an age of electrically-assisted steering and torque vectoring systems, I had to improve my driving to get the best out of it. The lack of power wasn’t an issue, either. Sure, I wouldn’t drive one every day, but I even buzzed back down the M1 from the Peak District and didn’t hate every second of it. The Caterham Seven 160 has unexpectedly become one of my favourite cars ever. Just save your cash and don’t bother with the (sold-out) Seven Sprint.